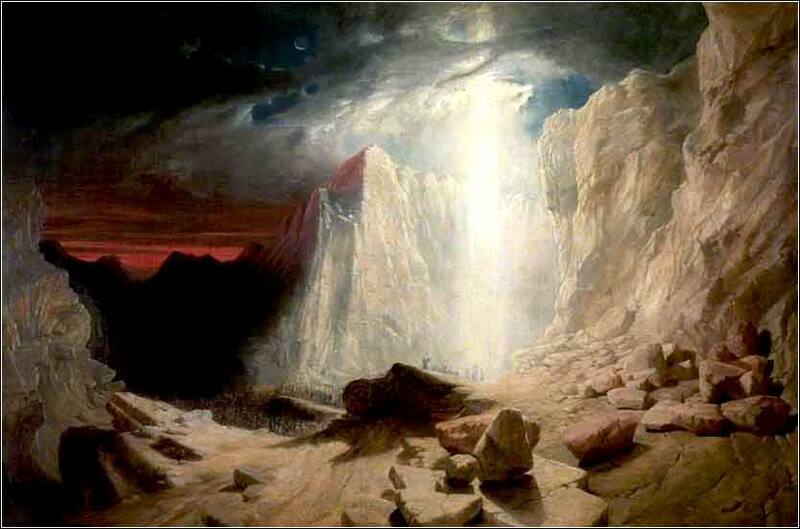 The Israelites Led by the Pillar of Fire by Night by William West, ca. 1845. This is a soft worship song with a gorgeous melody, despite its title, and is the best-known work of the gifted Australian singer and Hillsong worship leader, Darlene Zschech. 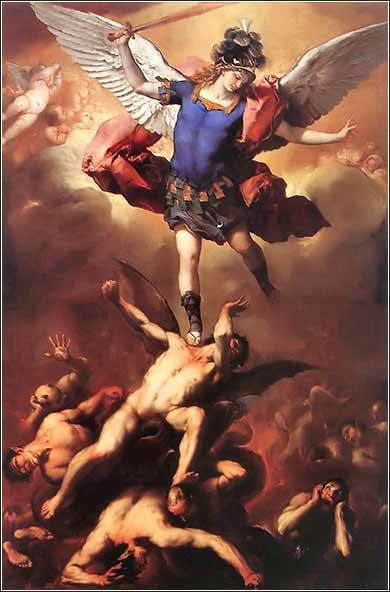 Archangel Michael Hurls the Rebellious Angels into the Abyss by Luca Giordano ca. 1666. Michael, the leader of God's army in Revelation, is the only being specifically described as an "archangel" in the Bible. Many scholars identify him with the angel promised to lead the Israelites in Exodus 23, but there is no scriptural reference to prove this. When my angel goes before you and brings you to the Amorites and the Hittites and the Perizzites and the Canaanites, the Hivites and the Jebusites, and I blot them out, you shall not bow down to their gods nor serve them, nor do as they do, but you shall utterly overthrow them and break their pillars in pieces. You shall serve the Lord your God, and he will bless your bread and your water, and I will take sickness away from among you. None shall miscarry or be barren in your land; I will fulfill the number of your days. I will send my terror before you and will throw into confusion all the people against whom you shall come, and I will make all your enemies turn their backs to you. And I will send hornets before you, which shall drive out the Hivites, the Canaanites, and the Hittites from before you. I will not drive them out from before you in one year, lest the land become desolate and the wild beasts multiply against you. Little by little I will drive them out from before you, until you have increased and possess the land. And I will set your border from the Red Sea to the Sea of the Philistines, and from the wilderness to the River [Note: the Euphrates], for I will give the inhabitants of the land into your hand, and you shall drive them out before you. You shall make no covenant with them and their gods. They shall not dwell in your land, lest they make you sin against me; for if you serve their gods, it will surely be a snare to you. Much of this is familiar territory for anyone who has followed the story of the Hebrews from Abraham to the gathering at Mount Sinai, but it is the best and most thorough statement of the old covenant we have seen, and adds several elements not previously promised. There are really three new things introduced here. First, God is going to withdraw in His present form, as a mighty presence atop the mountain so powerful that, for most men, merely coming close to Him will result in death. He will, instead, send an angel to go before the Israelites on their journey. The actual angels in the Bible are never sweet, innocuous pink children with wings and harps. At their most friendly, they might appear as men (as with Abraham) or a blazing light with a semi-human form, as to Mary before Christ's birth and at his tomb. But just as often, they are terrifying creatures of enormous power, with a capacity for destruction. The angel in this case is more akin to the latter category, for he is the instrument of God's wrath against the idol-worshipping tribes of Canaan. Whether they are manifestations of God himself, or separate beings, we are never 100% certain. More likely, we do not have the capacity to understand fully the nature of their existence. Secondly, God promises not only land and prosperity, but good health, and especially fertility for the women. This hearkens all the way back to Abraham, for the bloodline of the entire race comes from Isaac, a man whose mother was barren and aged when he was born. Finally, we learn that the conquest of Judea is to be gradual. God will not lead the Israelites to simply depopulate Canaan, for they are still a small people, perhaps roughly 20,000 (estimates vary enormously). In fact, as it turns out, it will be many centuries until they actually control the mass of land described — the time of Kind David — and even then, they will not follow God's clear directions. The Hebrews will never drive out the numerous heathen tribes and will, as a result, constantly fall into the worship of idols and every other practice forbidden by God.